If you’ve ever looked at the same image on two different monitors you’ll appreciate that each is likely to show it slightly differently. This may be because one screen is brighter or darker than the other, or slightly warmer or cooler in its appearance. Which is preferable is down to personal judgment, but in any case, the reason for the discrepancy is likely to be down to one or both displays not being properly calibrated. Monitor calibration aims to change the output of a display so that an image can be presented correctly and managed with greater accuracy. 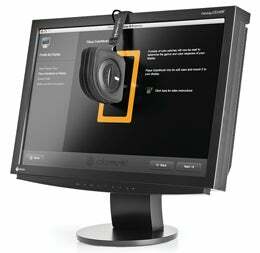 The quickest way to tell if your monitor requires calibration is to examine a suitable target. These targets show a series of patches ranging from black to white with a number of intermediate grey areas, and not being able to see differences in one extreme suggests that a monitor may be slightly out of line. For accurate evaluation it is necessary to use a piece of hardware such as a monitor calibrator which can be relied upon to measure a monitor’s output objectively. There are many devices available for the task but they all work on a similar principle. A target with known values is displayed by the monitor and a device in front of it analyses the output. The target will typically be a series of colours, as well as black and white which correlate to the brightest and darkest information capable of being displayed. Values from the input target are compared with the measured output, before the software used for calibration decides on what changes need to be made to the monitor to ensure that a colour fed into the system is displayed the same. Calibration is important because the likelihood of a monitor being correct in its reproduction without ever having been calibrated is slim. While adjusting settings for brightness, contrast and colour bias introduce immediate changes, the more gradual shifts in brightness and colour temperature that happen over time are likely to go unnoticed. Environmental factors, such as the quality of the ambient light, also affect the appearance of a monitor; high-end monitors often come bundled with monitor hoods for this reason.